Recent ore pass failures have underlined the need for improved designs, standards, structural monitoring methods and better hang-up prevention and removal techniques. 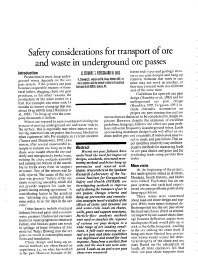 Researchers at the Spokane Research Laboratory of the National Institute for Occupational Safety and Health (NIOSH) are investigating methods to improve safety during the transport of ore in ore passes. Design criteria and hang-up prevention and remediation strategies involve studies of the effects of static and dynamic ore and waste-rock loads on chutes, walls, gates and support structures. Particle-flow analysis methods were used to simulate the response of various ore pass designs to a wide range of ore loading conditions. A full-scale mockup of actual ore pass and chute assemblies was duplicated and tested for load response. Data from a particle flow code and the mock-ups were compared. Loads on an active ore pass chute were measured.